It’s been a summer of change at the top of the Irish media landscape. There was the departure Clare Grady at the Irish Independent, and then the end of summer appointment of Ian Kehoe at the Sunday Business Post, followed almost immediately by the news that his predecessor Cliff Taylor was taking up a new appointment as managing editor at the Irish Times. Clare Grady, the first woman to edit the Irish independent, departed at the end of August, with INM head of news Ian Mallon announced as her replacement as interim editor. Taylor’s parting of the ways with the Post after ten years as editor was announced a month earlier, with political editor Pat Leahy taking over as caretaker editor. Grady’s announcement, after only one year in the job, was followed by an announcement by the INM NUJ chapel expressing its “disappointment” at the news, and calling for an “open and transparent” process in appointing her successor. A second NUJ motion on the same day noted “the deterioration in morale within INM titles and the oppressive management culture” which they claimed was “undermining the health and welfare of workers throughout the company”. The motion reminded senior management of their obligation to ”ensure that all employees are allowed to work without intimidation or fear of bullying”. Clearly, there are troubling morale issues in Talbot House. The reasons for Grady’s departure were unclear, though there were some suggestions it was because of her failure to halt circulation declines. Considering how every newspaper in Ireland is bleeding circulation, it seems particularly unfair to blame Grady for the rise of the internet. 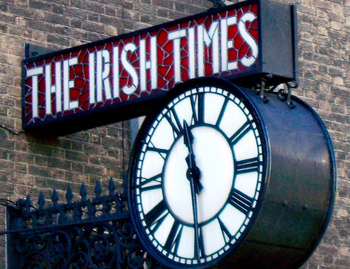 Meanwhile after ten years at the helm of the Post, Cliff Taylor’s new position at the Irish Times is something of a homecoming. He was previously and economics editor and managing editor there, and his return is seen as staunching the flow of institutional memory in Tara Street, battered by the impact of successive redundancy waves over the last decade. Kehoe meanwhile faces an uphill struggle at the Sunday Business Post. The weakest of the weekend titles since the demise of the Tribune, the Post’s circulation is in freefall, though they can take some comfort from the fact that the valuable ABC1 social demographic are strongly represented among those who remain. Kehoe’s problems are far from unique however. The overall newspaper market continues to contract, shrinking by seven percent in the year to June 2014. Worse, the newspaper market has been decoupled from general economic growth since 2009. As if the Great Recession wasn’t enough, it coincided with the point where readers abandoned paper in numbers for digital, and while some titles are doing well online, internet advertising rates are nowhere near as lucrative as print. The Post’s paywall experiment is facing an uphill battle while other titles are free online, and it’s difficult to see how a general publication can offer a unique product readers are prepared to pay for. Circulation revenues also disappear online, and general titles suffer particularly hard. The Farmers Journal manages to offer a compelling mix of timely business news and features which readers are prepared to pay for (helped by the fact the general titles have a poor understanding of agribusiness, where the major stories happen outside Dublin). The Post doesn’t have the advantage of such a well defined niche. The weakest of all the Sunday titles, it’s difficult to see a good exit strategy for Paul Cooke and Post Publications. However, there is one cheeky possibility the Post could avail of to give itself a boost. Unlike the Irish Times and the Independent titles, it barely avails of bulks, the free copies given away in hotels, coffee shops and colleges to boost readership figures. Bulks account for 12% of of Irish Times (9140) and Irish Independent (14083) Audit Bureau of Circulation (ABC) figures, sand the Sunday Independent bulks came to 11463 copies (five percent of total) in the last ABC audit. During the same perios, the Post figure for bulks was only 994 copies. A few more bulk copies might not be enough to reverse the decline in headline circulation, but with readers seemingly unwilling to shell out for a full price copy of the paper, it could be a valuable advertising/promotional tool. This entry was posted in Social & Cultural and tagged Farmers Journal, Irish Independent, Sunday Business Post. Bookmark the permalink.